Caramelised onions are great for enhancing burgers, pasta, salads and starring in the classic dish, French onion soup. Cooking them to perfection usually takes some time, but a pressure cooker can speed up the process. Photo by J. Kenji López Alt. J. Kenji López Alt at Serious Eats has shown us you can make a batch of caramelised onions much faster with a little bicarbonate of soda, but admits they don't quite taste as good as the "real" slow-cooked kind. Fortunately, he's found another awesome way to speed up the same process and still get the best flavour: using a pressure cooker. 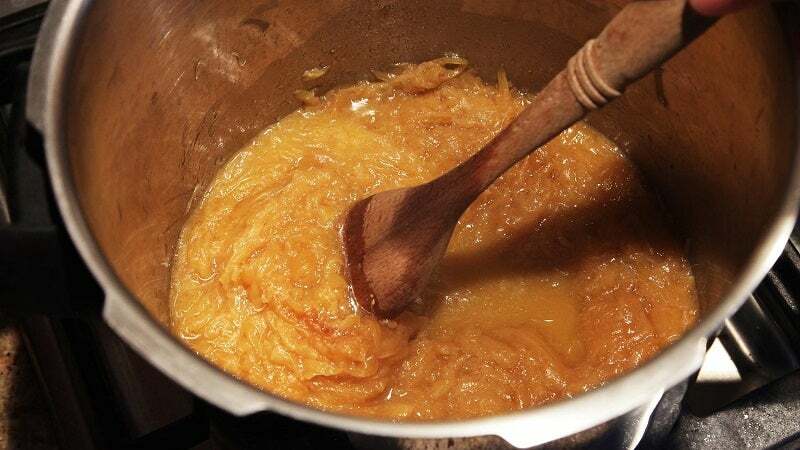 Start by melting some butter in your pressure cooker, then add your thinly sliced onions with a little salt, pepper and a pinch of bicarbonate of soda. Put on the lid and crank the heat up so your pressure cooker reaches high pressure. In about 20 minutes you can release the steam and reduce the excess water so all you're left with is tasty, dark brown caramelised onions. You can learn more about the process at the link below.